The price computer makers paid for solid-state drives (SSDs) dropped by as much as 12 per cent over the last quarter, and the most popular drives are now within striking distance of their hard disk drive (HDD) counterparts. 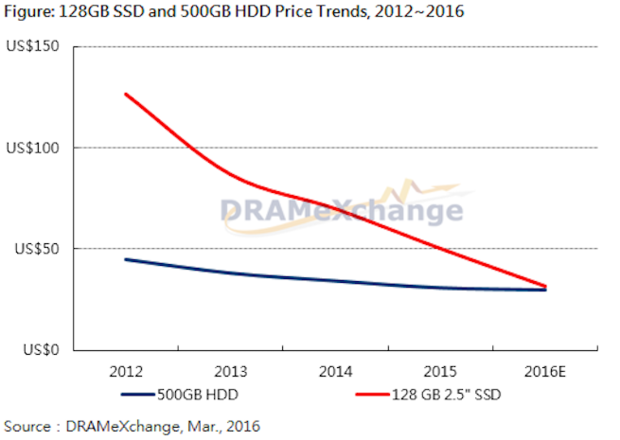 In the first quarter of this year, MLC-based and TLC-based SSDs respectively saw price declines of 10%-to-12% and 7%-to-12%, respectively, according to DRAMeXchange, a division of TrendForce. A 128GB SSD now retails between $US38 and about $US49 (Amazon price). A 250GB SSD runs anywhere from $US52 to $US81 (Amazon price). Last June, the average retail price consumers pay for a 128GB SSD was $US91.55; for an SSD in the 240GB to 256GB range, the price was about $US165.34, DRAMeXchange's data showed. Based on DRAMeXchange's analysis, the price difference between 128GB SSDs and 500GB HDDs will shrink to less than $US3 this year. The price difference between 256GB SSDs and 1TB HDDs is also expected to be less than $US7. That said, at a per-gigabyte cost, SSDs are still about five times pricier than HDDs. The market for SSDs with a capacity of 250GB to 500GB is expected to grow at the highest annual rate between 2016 and 2022. The price of TLC (triple-level cell) SSDs did not fall as much as MLC (multi-level cell) counterparts because most SSD manufacturers are just starting to ship their TLC products (Samsung being the exception). TLC SSDs store three bits of data per NAND flash cell; MLC SSDs typically store two-bits per cell (though MLC can be a general term for any drive that stores multiple bits per cell). At the same time, SSD adoption rates in laptop computers will by more than 30% this year, DRAMeXchange said. 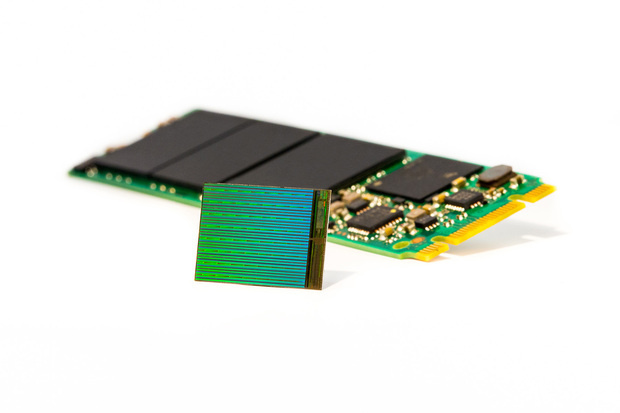 The SSD market is expected to grow by 9.5% a year through 2022 from $US13.29 billion to $US25.3 billion, according a report released today by MarketandMarket in India. Factors affecting SSD growth include the proliferation of cloud computing, performance advantages of SSDs over HDDs, an increase in the number of data centers, and rising big data applications, MarketandMarket said. 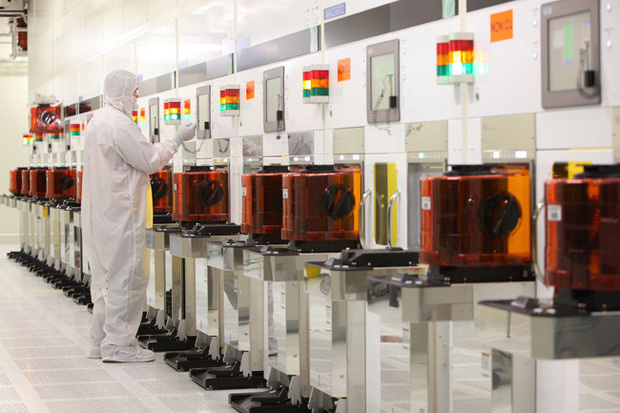 Intel is converting its fabrication plant in Dalian, China from producing processor chips to 3D NAND flash chips. SSDs using the SATA interface, which allows notebook and desktop users to make simple changeovers from HDDs to flash, are expected to account for the largest share of the SSD market over the next six years. SSDs using SATA interfaces are also lower cost than those using serial attached SCSI (SAS) and PCIe interfaces, which is also driving growth in the SATA segment, MarketandMarket said. That said, the market for SSDs with PCIe interfaces, which are used by laptop makers such as Apple to attach flash directly to a motherboard, is expected to grow at the highest annual growth rate ever over the next six years. "This growth can be attributed to the advantages of PCIe, which include high speed, enhanced performance scaling, and detailed error detection and reporting," the report said. "Thus, the demand for SSDs with PCIe interface is expected to increase from the client as well as enterprise end users." Samsung, according to TrendForce, will continue to dominate the SSD market this year because of a price advantage it has with TLC-based SSDs using 3D-NAND flash, which Samsung markets as V-NAND. V-NAND stacks silicon cells up to 48-layers high to increase density, thereby reducing cost. Samsung Electronics announced this week that it's shipping the industry's highest-capacity SSD, the 15.36TB PM1633a, which uses its V-NAND TLC flash memory. Micron's 3D NAND chip stacks 48-layers of flash cells atop one another, but Samsung is the only 3D NAND maker currently shipping product in bulk. Other SSDs makers, including SanDisk, Liteon, Toshiba and SK Hynix, are ramping production of 15nm and 16nm process TLC SSDs in an attempt to catch Samsung. While most SSD makers have their own versions of 3D NAND, currently only Samsung is mass producing them, TrendForce said. Competing brands will not ship their first-generation 3D NAND SSD products until the second half of 2016 at the earliest.